Natural gemstone jewelry, commemorative photos, bird boxes, natural skin care line, dog walking and pet sitting are a few of the businesses being operated by some of the island’s young entrepreneurs this summer as part of the BEDC’s Summer Student Entrepreneur Programme. Junior Minister of Home Affairs, Economic Development & Tourism, Senator Crystal Caesar provided an overview of the programme in the Senate saying she was “excited to provide an update today on a new initiative, spearheaded by the Bermuda Economic Development Corporation, with complete support and sponsorship from the Ministry of Economic Development and Tourism, which aims to help the Island’s next generation of young, entrepreneurial minds launch and sustain their own businesses. Senator Caesar said, “You will recall back on July 4th, the Minister of Economic Development and Tourism, the Honourable Jamahl S. Simmons, JP, MP held a press conference launching the Summer Student Entrepreneur Programme [known as SSEP, for short] and encouraging Bermuda’s young entrepreneurs to apply to this new innovative programme. “That clarion call saw sixteen young people submit creative entrepreneurial ideas for support, and while it was difficult for the BEDC team to decide, as all the ideas were excellent, ten student entrepreneurs were finally selected. “The SSEP is currently in full swing, with ten young people between the ages of 14 and 20 participating. The initiative began on Monday, July 9th, walking young people through a series of business training lessons in areas such as marketing, time management, customer service, business planning and navigating through any legal aspects of running a business, including health, safety and liabilities. “I am excited to say that the programme has already proven a success, teaching some of Bermuda’s young people how to do for themselves and chart their own path towards economic success. “The initiative aligns perfectly with the BEDC’s mission to “inspire, inform, support and grow new and existing Bermuda businesses through education, guidance, data provision, advocacy, networking and financing”. 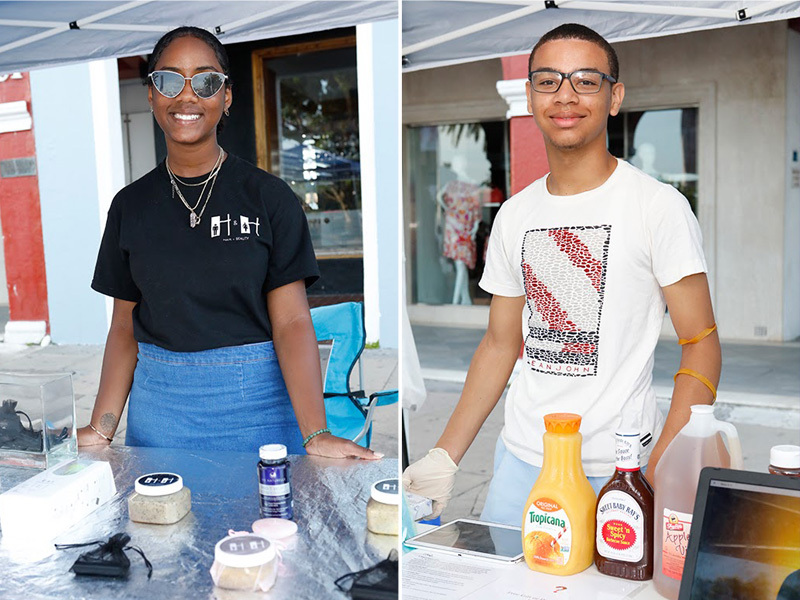 Its overall goal is to promote entrepreneurship as a viable career option for Bermuda’s young people to pursue, and will continue from now until Friday, August 31. “Whereas in the past, the number of programmes and tools available to help young people thrive as 21st century business owners, were very few, SSEP now provides high school and college age students with a blueprint as they navigate the road to financial independence. “In order to take part, students had to apply to BEDC by the July 6th deadline, outlining their basic business plan, and provide a cash flow forecast and brief SWOT analysis. To be eligible, they had to be Bermudian and have a GPA of 2.0 or higher. And while 16 young people applied, in the end it was the ten with the most compelling and innovative business ideas who were selected for the first SSEP Cohort. “At the start of the programme, the students were given a working capital advance from the BEDC to help towards start-up costs, such as materials and equipment needed to execute their business ideas. Once a week for the duration of the scheme, the students will be required to meet with the Programme Coordinator, Mr. Naeem Alom, in order to provide a progress report. “The initiative will end with a special Award and Certificate Ceremony, where cash prizes will be presented to the top three business earners who generated the most income during the summer months. The first prize winner will take home an additional $1,500. While SSEP is currently a pilot programme, the hope is that it will run annually each summer or even year-round to provide more consistent opportunities and support to young entrepreneurs. “I join with my esteemed colleague, Minister Simmons, in the belief that a spirit of entrepreneurship must be nurtured and encouraged, especially within our youth. 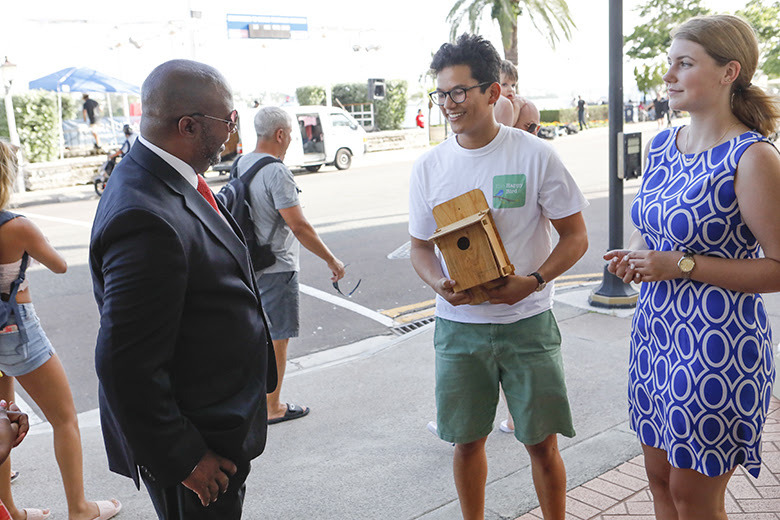 The opportunity to encourage more Bermudians to do for self and open doors for not just themselves, but others as well, will go a long way towards reshaping our island into a better and fairer Bermuda. “The Summer Student Entrepreneur Programme will provide our youth with the chance to immerse themselves into entrepreneurship, to create summer employment for themselves and it is our hope that they can also begin a lifelong passion for business ownership. We see this as a great opportunity for any aspiring young Bermudian and are very excited to see the level of talent and enthusiasm that already surrounds the initiative. “You may have already seen that several of the SSEP participants have made their way into national news headlines in the past few weeks. Seventeen-year-old Paige Martin was highlighted in the daily for her business, Life Assistance, providing busy working people with support doing mundane tasks such as babysitting, grocery shopping and scheduling medical appointments, that professionals ordinarily wouldn’t have time for. “While the youngest participant in the programme, 14-year-old Andreaz Glasgow has also been spotlighted in the local media for his business, Guess What?, offering what he believes is a safe, affordable and fun taste testing experience for the Island’s thrill seekers. 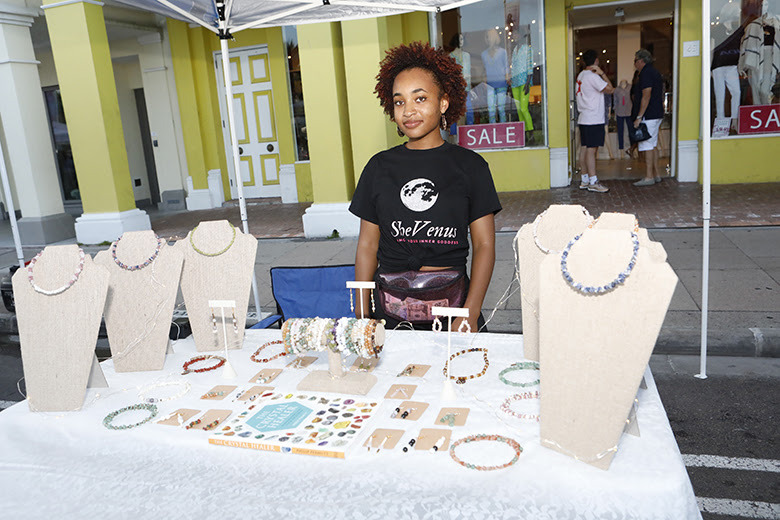 Kalir Stevens, 19, with her natural gemstone jewelry business, SheVenus. Asah Robinson, 18, with her food business BDA Pretzel, offering warm pretzels in a few different varieties. Tyler Trott, 17, who is offering commemorative photos for tourists, to remember their experience in Bermuda. Christian Chin-Gurret, 20, whose unique design of bird boxes, requires no tools to be assembled. Asia Atienza, 18, who has created a natural skin care line of products called Lucid. Yndia Raynor, 19, who offers animal-based services such as dog walking and pet sitting. Jaden Taylor, 17, offering unique flavors of popcorn, as well as other snacks, to beach-goers at Horseshoe Bay. And Kayuntae Ming, 19, who has an all-natural skin and hair care products, including her best seller ‘Shea Lemon N’ Honey moisturizer’. Kayuntae is also a recent “Vend 2 Win” Competition winner and was one of the five vendors who accompanied the BEDC to vend in New York earlier this month. “The success of the SSEP programme has been made possible thanks to the support of several Government Departments. The Department of Health has been instrumental in aiding these young people in their endeavors, by providing them with a six-week temporary health certificate and license at no cost. While the Department of Parks has also met with a couple of students to help them jump over any barriers needed to set up their small businesses at Horseshoe Bay Beach. 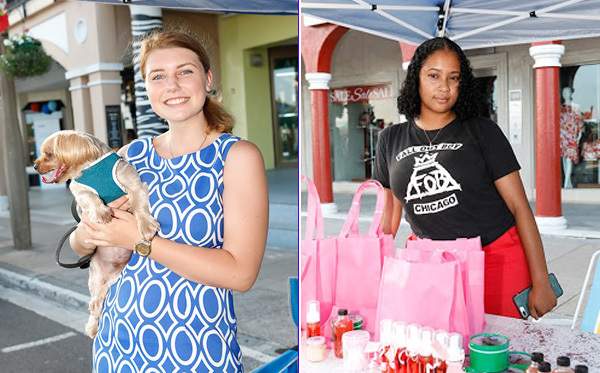 “Other partners have also played a significant part, including the Chamber of Commerce, who has provided all ten students with a vending license for Harbour Nights, while the West End Development Company [WEDCO] has granted five students a vending license to sell their products and services in Dockyard, both complimentary. “Likewise, both the Corporations of St. George and Hamilton have been supportive in providing complimentary locations for some of the student entrepreneurs in the Town of St. George and the City of Hamilton. “In closing, Madame President, while these young entrepreneurs are still in the early stages of business ownership and operations, all of them are already well on their way to making their first sales. 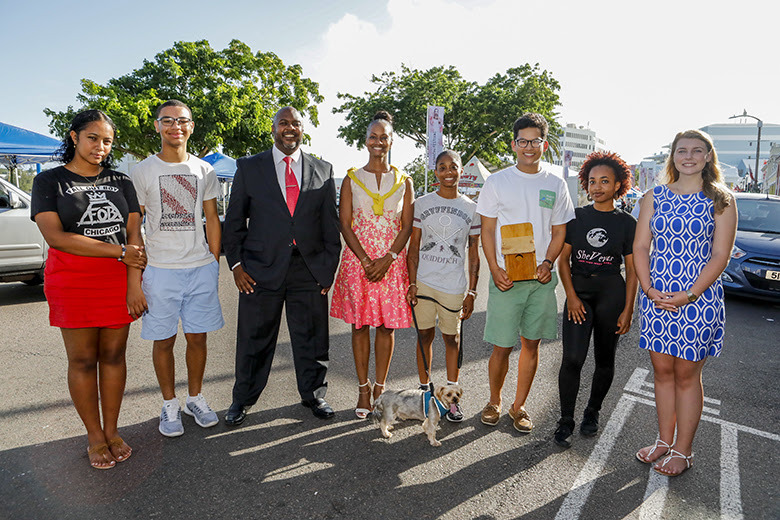 “They give me a sense of hope knowing that Bermuda’s entrepreneurial future is indeed very bright, and I am confident these young people will continue to grow into their full potential.